Cleanserp is a browser hijacker which might illegally enter your computer and then hijack all your browsers making them to load a new page Cleanserp. Browser hijackers usually change all web browsers’ settings, including a homepage, search tool, and a New Tab page, so it is impossible not to see a new search tool. Not all the users immediately realize that altered settings of their browsers indicate the entrance of a browser hijacker, and they use Cleanserp fearlessly. It is a huge mistake they make – using Cleanserp as a tool for searching the web might result in so many different problems. The most frequent problem users experience is the entrance of dangerous malicious software. Additionally, what they do not know is that their privacy might be violated too if they continue using a new search tool. If you have discovered this new URL set on browsers only recently, delete Cleanserp as soon as possible because you might experience problems tomorrow. Why should I uninstall Cleanserp? 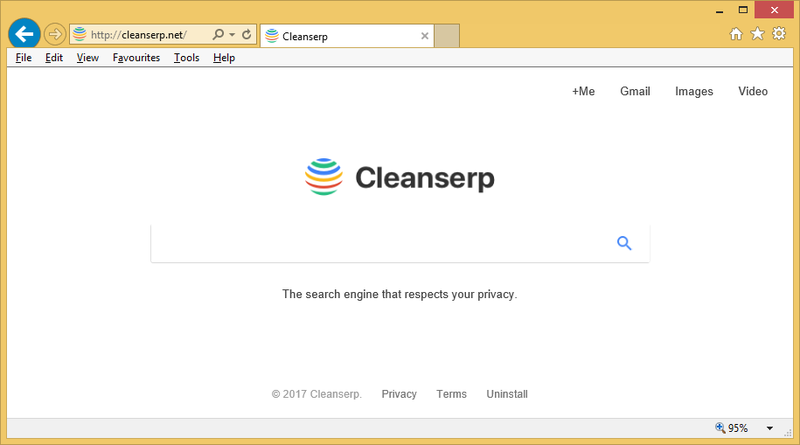 Cleanserp is not a search tool that can be trusted, so if you ever discover it set on browsers, eliminate it as soon as possible. If you do not do that soon, you might experience all kinds of problems. First of all, due to the presence of sponsored search results promoting third-party pages, you might end up on a website with a malicious content. Malware will surely not miss an opportunity to enter your computer if you land on an infectious page. These sponsored search results might also redirect users to pages which collect information about users. They will steal personal information from you and then might sell it to cyber criminals. This might result in the violation of your privacy. As can be seen, the main drawback of Cleanserp is all these sponsored search results and, unfortunately, the only way to be sure that it is impossible to click on them is to implement the Cleanserp removal. Where does Cleanserp come from? It does not surprise us at all when users say that they have not set Cleanserp on their browsers voluntarily because it is already known that browser hijackers always enter computers illegally. They are usually distributed using a deceptive method called bundling. That is, they travel in small bundles with all kinds of free applications to hide themselves from users. It does not mean that it is impossible to notice them – all users need to do is to install new software attentively. It is advisable to have an active security application on the system as well. How can I remove Cleanserp? Although Cleanserp reminds of a legitimate search tool, it is not a useful tool, for sure, so it can only bring problems instead of improving your web searching in any way. There are two ways to remove Cleanserp from browsers: manual or automatic. It is up to you how to delete Cleanserp from your PC, but if were you, we would choose the automatic method. It will be easier to implement the Cleanserp removal automatically because you will only need to get a reliable tool and then open it.